3. the endosperm - the "white" bit - which has starches and carbohydrates as well as protein, iron, and B vitamins. When you forego the bran and the germ you forgo important vitamins, minerals, fats, and fibre. Fact. 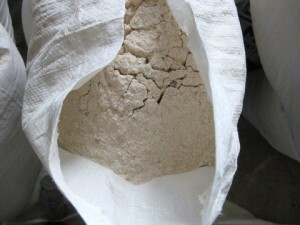 Stone ground white flour, however, is somewhat better for you than industrially milled white flour. In a stone mill, whole grain goes in the top and whole grain flour comes out at the bottom. When the miller needs to bag white flour, the whole grain is sifted to separate the three parts of the kernel, leaving the ground endosperm in a bag as white flour. The aim of a stone mill is to produce whole grain flour. In an industrial milling process, grain goes through a series of metal rollers and, during the process, the bran and the germ are swiftly removed and what comes out at the end is white flour. The aim of the industrial milling process is to produce white flour. When an industrial miller wants to bag whole grain flour, a proportion of bran and germ are added back in again. So far so good. 1. 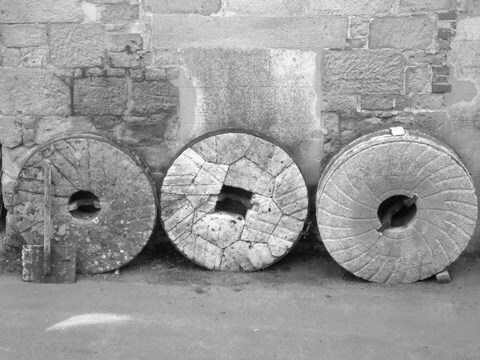 The stones in a stone mill stay cold whereas the metal rollers in an industrial mill get extremely hot. The heat effectively "burns" out some important nutrients before the flour is bagged. 2. 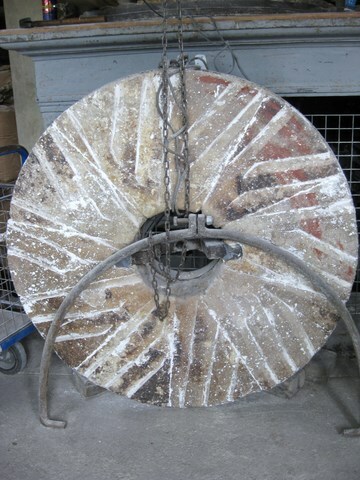 Stone mills produce whole grain flour and then process it (sieve it) to make white flour on demand. Industrial mills produce white flour and then process it (add germ and bran back in again) to produce whole grain flour on demand. In this process there is no way to guarantee that whole grain flour is actually whole grain. 3. Because stone mills produce whole grain flour, the ground endosperm (the white bit) has the benefit of being ground along side the oily germ during the whole process. The ground endosperm thus absorbs some of the oils and nutrients of the germ. Because industrial mills begin removing the germ and the bran at the beginning of the process, the ground endosperm has less opportunity to mingle with the oily germ and, thus, absorbs little of the nutrients contained in it. It's conceivable (I need to find a chemist) that white flour from a stone mill is higher in nutrients than whole grain flour from an industrial mill. It's certain that industrial millers could make flour that is higher in nutrients if they slow milled their grain so the metal rollers did not get so hot and if they milled for whole flour at the end of the process rather than milling for white. This all leaves the person who prefers white bread with a choice: You can ask your industrial miller how they mill. If they mill "cold" and for whole grain flour (seiving it to make white flour) then go for it. Your alternative is to find a stone miller and buy flour from them happy in the knowledge that your white flour is as nutritionally beneficial as it can be. The Traditional Corn Millers Guild has an excellent on line resource for finding a local stone miller, many of whom will do mail order. We have tried a lot of flour and the ones we love are listed here in the Virtuous Network. Some supermarkets sell stone ground flour. Always check the label. If your local supermarket does not stock stone ground flour you should ask them to stock it. The world will only change if we do something about it. The November/December edition of Resurgence Magazine has a special feature on craft. Satish Kumar is particularly interested in craft - in all things made by hand, for that matter. He believes passionately that we are becoming woefully un-self reliant, a nation of people bred and educated to work in offices and capable of doing very little else - frighteningly incapable of looking after ourselves. For that issue, Resurgence kindly asked Virtuousbread.com to write an article on bread craft. The whole article can be read in the magazine but we wanted to extract a bit about stone milling here because of its relevance to a conversation at the week end about white bread. Hi there, I've just stumbled upon your site and am reading it with avid interest. I have recently started to investigate the importance of bread, and have chosen to make all my own bread with stonegound flour. I understood it that the industrial process of making wholemeal (brown) flour was to process it to the result of white flour, then add just the bran back in - rather than the germ as well - becuase its the germ causes the flour (or bread) to go rancid quickly. Removing this therefore helps to give the flour/bread a longer shelf life. Have i got this wrong? Really interesting reading. Thanks for all the info! thanks for your comment. The explanation is a little more complicated in that every miller does his or her own thing, milling to a "recipe". Industrial millers mill to all sorts of recipes: for supermarkets, their own labels and the huge bakers to whom they sell flour. How much bran and germ is in the mix is up to them. The important thing is that the processing is extreme - heat, pressure - and this leads to a product that is inferior in every way to a stone milled flour. Stone millers also have their own recipes but whatever they mill the process is gentler and the nutrients are more intact. Wheat germ is oily and does go rancid - but not that fast. All flour (from stone millers too) has a sell by date and this should certainly be respected because of the oil in the germ (and the freshness of the overall product). There is a great resource in the UK called the Traditional Corn Millers Guild and there you can locate a local mill and find lots of great information. Also, The Real Bread Campaign is an excellent source of information. Thanks again! For any really technical milling questions (including what kind of stone mill to buy) I would refer you to Andrew Wilkinson at Gilchesters Organics in the UK (you will find them online). The milling process in general for stone mills is: Introduce cleaned grain, mill for whole meal flour at the texture you want, seive off the bran and germ to the extent that you want. In a roller mill, typically, the bran and germ are removed first and then the endosperm is separately milled. Then the bran and germ are re-introduced depending on the type of flour that the mill wants to make (brown/whole meal, etc). I don't know how Bob's mills their flour. To be honest, the best stone milled flour is in the UK. There is a wide variety and there are mills (electric, wind, water and tide) all over the country. Clearly I am not sure what capacity you want to mill, nor what you want to mill. There are many many differences between stone and roller milled flour. And between different stone milled and different roller milled flour. The millers decide what they want their flour to look like, taste like, and how they want it to perform (nutritionally and technically in its use). First you need to decide what you want to achieve and then you can decide what kind of mill you want. Again, Andrew at Gilchesters or Michael Stoat at Cann Mills (again you will find them online) will be able to answer all your questions!